Average Height	: 18" - 23"
Average Weight	: 30 - 45 lbs. The Border Collie was originally called the "Scotch Sheep Dog" and originated in Northumberland along the borders of Scotland and England. It is a descendant from dogs used by the Vikings to herd reindeer, the old British droving breeds, with spaniel added. Named a "workaholic" for its sheer drive and love for working, the Border Collie has an eye that can hypnotize cattle. 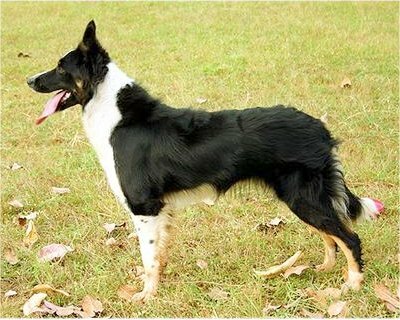 •	Border Collies are well known to be a very 'active', high energy breed. •	They Require long daily walks/runs. •	This Breed is not suited for apartment living. •	As a 'pack' dog ~ they get along with other dogs/pets in the household. •	Border Collies require fenced yard. With their tremendous sense of smell ~ if they catch a 'scent' they're off on the hunt! •	This breed also requires being on a 'leash' for the same reason: if they 'pick up a scent' ~ they'll be gone hunting it down. Training this dog requires patience due to their high level of energy, but they respond well to obedience work, agility, fly ball, rally-o and other games. The Border's main raison d'etre is herding sheep and their stamina and patience is highly renowned. Known for their hypnotic eye, the Border's herding skills are second to none - using eyes only to guide a herd - no nips or barks. Highly intelligent with a high instinctive drive to work intensely with a human handler. They are demanding, energetic, busy minded and busy outside and inside (even if they have just been exercised). They are rather like the Arabians of the horse world, high endurance and incredible stamina are the hallmarks of this working dog's heritage. In fact they have been bred to run many miles a day over some unimaginable terrain, but yet they get up and do it all over again the next day. Border's are the Type A personalities of the canine world, always wanting to work no matter what the job is - dogs sports or herding. They must have plenty of exercise, no sitting around in a yard or the house for this breed. A workaholic to the core, the Border can become neurotic, destructive and obsessive if it gets bored. Bordeom may manifest itself in the form of heading just about any thing that moves, including bugs, children, cats and brooms. Sponges for affection and hogs of the lime light, these dogs will watch you intently always winding up underfoot. People-oriented, the Border needs to receive very good socialization as a pup. Older Borders are rather stand offish with people they don't know, and can be aggressive with other dogs. Despite being as intelligent as they are, they mature slowly and seem to be able to manifest "puppy brain" behavior even into their senior years. So be prepared for the class clown of the herding world. Maturity and dignity don't become words used with a Border until they are about 3 - 4 years old. The Border has a medium/long coat, and needs to be groomed (combed and brushed) at a minimum of once a week. Although, they are considered to be fairly low maintenance since their coats actually shed dirt fairly well. Borders have no end to their energy both indoors and out. If left to their own devices, you won't like what you find when you get home (chewed walls, books, carpet etc.) Outside they will entertain themselves by digging holes. The goal would be to stimulate both the mind and the body of your Border - engage his boundless curiosity and intelligence. The best exercise regimen for your Border Collie would be at least two 45 minute walks a day, no matter what the weather may be. While you may not be too happy with the weather, your dog doesn't mind in the least. This may vary depending on your dog, as each one does have its own personality. While on your walks try to have about 20 minutes full tilt running off leash and include a game of fetch or even a tug of war. You need to also include at least 15 to 30 minutes of obedience training, trick training or other activities that keep your dog's mind sharp. If he's mentally stimulated he's happy. If he's happy, he's well-behaved. If you don't think what you are doing is enough for your dog, don't increase the physical part of your routine, increase the educational portion instead. That would mean more obedience training, tricks - things to keep his mind busy - to stretch his mental limits. Working his mind will make him more tired than working his body - remember, their stamina is phenomenal. And they ALWAYS have energy to spare, even when you don't! Borders are one of the smartest breeds hands down and learn very quickly. Their intelligence isn't the issue the trainer is the issue. These dogs are very difficult for the average person to train. These dogs are so intelligent that they can actually manipulate you to do what they want you to do. Some can be very willful and dominant - the Alpha dog - and the only way to work with that is to prove to them that you can make them do things. They are very sensitive dogs and a harsh correction may make them freeze and shut down on you - for instance roll over on its back or pay close attention to something else besides you. Or, they may also get even more anxious and speed up, which will cause more miscues. You need to be firm and consistent with them because they will try and get away with as much as they can. Also be careful about sounds, as Borders are very sensitive to sounds. The most frustrating part about training a Border is their hypersensitivity to the slightest sound or movement you make. They try to anticipate what you want them to do and guess at what comes next. Trying to get them to actually remain still and wait for the actual command is challenging to say the least. The best type of training for the Borders is motivational with lots of treats/play time. And another love of Border Collies is tricks. They love learning new things and can be taught some great stunts like playing dead or rolling over - anything so they can show off. It appeals to the clown in them.